Mara Hoffman is the queen of exotic resort wear. This New York-based designer is known for her bold colors, exotic prints, and amazing fitting swimwear. And since I have Puerto Rico and Thailand on my mind I figured a little Mara Hoffman craving was just right. Loving the print in that one piece! oh. my. gosh. the first suit is gorgeous!!! I wonder what it would look like on? So pretty. and so very jealous of your upcoming travels! Cant wait for pictures! Dying over that first suit! 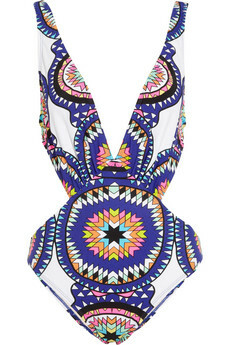 The 1st swimsuit is so amazing!